When I started Finnovation Product Development I bought a Dimension 1200 Es with SST (Soluble Support Technology). The 1200 Es SST is a good professional grade 3D Printer that allows the user to create durable ABS parts for prototype and some limited functional use utilizing FDM (Fused Deposition Modeling) technology. Initially, I used the 3d Printer to make prototypes for clients pursuing patents and the development of product ideas. It was a great use of this particular machine, however I saw the emerging market that 3D Printing offers and decided that I needed a machine that could produce large volumes of functional parts quickly, reliably and affordably using diverse industrial grade materials. I began looking into technology offered by FORTUS which is Stratasys (SSYS) FDM technology. The FORTUS line is the big brother to the Dimension and is used for Additive Manufacturing large volumes of parts and offers a wide variety of materials that are usable in manufacturing on all levels. Finnovation targets the production of 3D printed parts for functional use in all aspects of manufacturing, and the FORTUS 400MC was an appealing option. Compared to the Dimension 1200, the FORTUS is faster, offers a larger build volume, finer layer resolution, and upgraded software with more control over the STL files needed to create the functional parts. Again, a solid contender to fill Finnovation's need for production grade 3D printing technology. "...pitting the sPro SLS Center against the FORTUS 400MC is like Muhammad Ali squaring up to Elmer Fudd." However, there are aspects about the FDM process and technology that caused hesitation in purchasing***. The FDM technology is extremely wasteful and requires toxic chemicals to process the 3D printed parts. This requires more time to completely rinse the parts free of these chemicals, which delays delivery time. Each material cartridge can be recycled but there is no incentive other than environmental responsibility. This shows lack of concern for the environment and Finnovation demands more from its vendors and partners. The decision to look for another solution to my production grade 3d printing need was sealed when I found out that it cost $15,000.00 to add a single material option to the FDM technology. It is my understanding that this "upgrade" is actually just a software switch that allows the extruder head to heat up to a specific temperature needed for that particular material. I decided to look at 3D Systems (DDD) technology as a possible alternative solution. 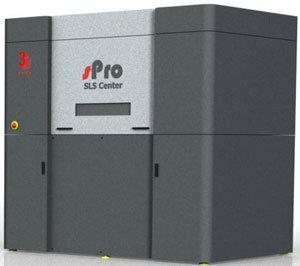 I inquired about 3D Systems SLS (Selective Laser Sintering) technology, and was quickly contacted by a salesman who consulted with me about my intentions and what I am looking for in a 3D Printer. The 3D Systems sPro 60 was the recommended machine and does everything I was looking for and more. I quickly arranged the purchase of the sPro. If the emerging market of additive manufacturing is a boxing ring, pitting the sPro SLS Center against the FORTUS 400MC is like Muhammad Ali squaring up to Elmer Fudd. What makes the 3D Systems sPro 60 SLS Center dominate all FDM technology? Diverse material options including carbon fiber reinforced Nylon, PEEK, and 100% dense metal parts. 0.003" layer resolution - ultra smooth surface finish. Material options are more applicable to functional use in industry with superior strength. produces 10X the amount of parts that FDM can in the same time frame. No material upgrade cost : material packaging is not engineered to keep the user dependant on wasteful designs. preferred technology of high end manufactures including GM and Boeing to create functional parts in industry. Environmentally friendly: sPro uses scrap Nylon to create functional parts. Effectively converting garbage into usable machine parts. 0% chemicals needed to process SLS parts. 3D Systems has shown continuous innovation in improving their technology. If I had purchased the FORTUS 400MC instead of the 3D Systems sPro 60, I would be trailing behind my competition. Instead, my competition struggles to keep up with Finnovation's rapid manufacturing capability. There are more sPro SLS 3D Printers on the way to Upstate New York to further expand the capabilities of Finnovation to delivery functional machine parts in days. Bad news for FPD's competition. Great news for manufacturers who demand elite results from the latest production grade Additive Manufacturing technology. Have you been using FDM technology for your 3D Printing needs? Allow FPD to show you the quality of SLS 3D printed parts. If you are not 100% satisfied with the SLS version of your part, then Finnovation will complete your entire order using FDM at no additional cost. We still have FDM technology, it's just a little dusty! Contact us today for more information on the FPD FDM challenge. ***Info accurate at the time of purchase.